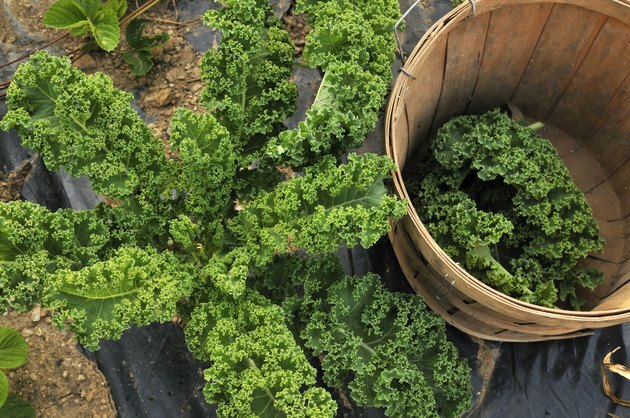 Sometimes called the "clotting vitamin," vitamin K is required for the blood to clot properly and also helps with bone formation and promotes bone health. Naturally found in a variety of foods, including leafy green vegetables and liver, vitamin K is also produced by the bacteria in your intestinal tract during digestion. Because vitamin K is fat-soluble, it is stored by your body, making it is possible to take in too much vitamin K. However, there is no definitive amount of vitamin K that is considered excessive. The recommended daily intake of vitamin K for infants up to age 12 months is between 2 and 2.5 micrograms, while for young children, ages 1 to 3, it's 30 micrograms. For children ages 4 to 8, it's 55 micrograms, while for children ages 9 to 13, it's 60 micrograms. The recommended daily intake for adolescents, ages 14 to 18 is 75 micrograms. For adult men, the recommended amount of vitamin K is 120 micrograms, while for women, including pregnant and breastfeeding women, it's 90 micrograms. As it helps with blood coagulation, vitamin K can affect how useful aspirin or other blood-thinning medications can be. If you consume a diet high in vitamin K-rich foods, or if you are taking a supplement of vitamin K, consult your doctor prior to taking medications to help prevent clotting to avoid possible complications. Vitamin K can also adversely interfere with some antibiotics, as well as certain weight-loss drugs, such as olestra. In the case of the latter, these weight loss drugs inhibit your body's fat absorption ability, rendering it more difficult for your body to absorb, or retain, vitamin K.
Because vitamin K is fat-soluble, kidney dialysis will not flush the vitamin out of your system. Vitamin K is also not effective in treating clotting problems resulting from severe liver disease. Because vitamin K may inadvertently cause more damage to a diseased or damaged liver or kidney, if you suffer from kidney or liver disease, avoid taking vitamin K supplements and consult with your doctor concerning vitamin K in your diet. Vitamin K is produced during the digestive process by the bacterial flora in your intestinal tract. However, this is not enough to provide sufficient amounts of vitamin K to your body. That's why it is necessary to obtain vitamin K from your diet, or take it in supplement form. Leafy green vegetables, such as kale and spinach, are rich in vitamin K. The darker green the vegetable, the more vitamin K it contains. Vitamin K is also naturally found in the cruciferous family of vegetables, which includes brussel sprouts and cauliflower. Vitamin K is found in fish, eggs, liver and meat as well.